The Re-Ride is Coming Soon on June 10th–20th 2019 from Missouri to California! 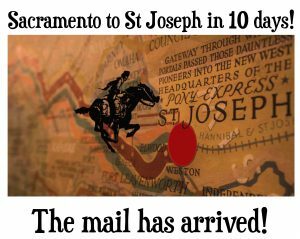 Follow the Pony Express Re-Ride and the mail as they travel 1,966 miles from St. Joseph, MO to Sacramento, CA. The Pony Riders travel day and night to make the 10 day trip. There is a GPS that is carried in the Mochila. While viewing the map you can zoom in and out for a better view. This map will be active 24/7. This map can also be viewed in a separate window. 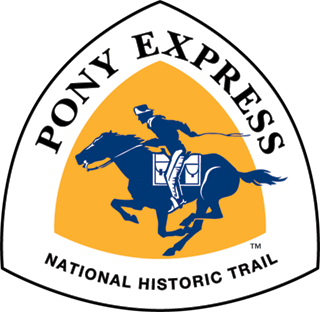 You also can check the National Pony Express Hotline at 1-855-809-8589. This Hotline is updated as soon as reports begin coming in from the trail. These reports come from riders, support staff for the riders, Radio Ham Operators and from the interactive map. Stories and status updates are also added to our Reports from the Trail. STATUS: The 2018 Pony Express Re-ride arrived at the Patee House in St. Joseph, MO at 8:45pm CDT to a good crowd despite the weather! Congratulations to all the riders and for everyone's support! Go Pony 2019! FROM: National President Dean Atkin via phone. STATUS: After catching up the lost time, the Pony was held up by a severe thunderstorm with lightening near Elwood, Kansas near the Missouri River. 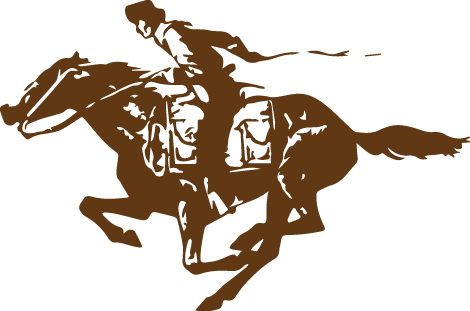 The Kansas rider handed the mail over to the Missouri rider at the Pony Express Bridge which spans the river between Kansas and Missouri at 8:00 pm CDT. STATUS: The Pony just arrived at Hwy 75 (Sac & Fox) at 1:30 pm CDT. The mail is only 1 hour behind schedule. STATUS: On June 30 at 10:50 AM CDT the Pony was at the Koch & Co. on the west side of Seneca, KS. The Pony is running about one (1) hour and 50 minutes behind schedule.